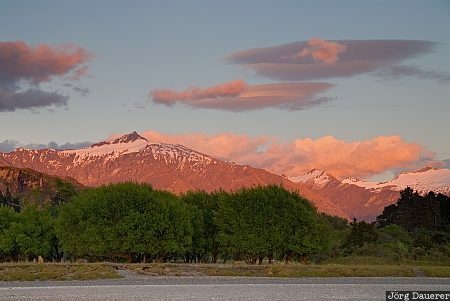 The shore of Lake Wanaka and Mount Aspiring illuminated by soft morning light with colorful sunrise clouds in the background, Otago, on the south island of New Zealand. This photo was taken in the morning of a sunny day in November of 2008. This photo was taken with a digital camera.